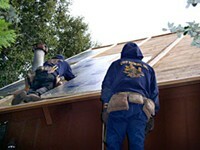 Our Company | Copp Roofing & Construction, Inc.
We serve ALL of Southern, Northern and Central California! 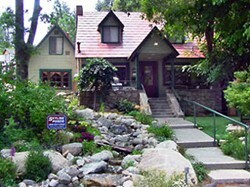 We also serve the San Bernardino Mountain Communities including: Lake Arrowhead, Blue Jay, Agua Fria, Twin Peaks, Rim Forest, Sky Forest, Crestline, Lake Gregory, Running Springs, Arrowbear, Big Bear City Big Bear Lake, Redlands, Loma Linda, Yucaipa, Banning, Beaumont, Bermuda Dunes, Palm Desert, Palm Springs, Cathedral City, Desert Hot Springs, Joshua Tree, Thousand Palms, Rancho Mirage, Indian Wells, La Quinta, Indio,& Coachella. Together, we are a group of experienced professionals offering the peace of mind our clients deserve by providing quality, efficient, and reliable work, ensuring outstanding value to the residential, commercial and industrial markets. By providing our employees and their families a healthy environment where they can grow, thrive and take pride in being a productive and valued member of the team, we create a grateful family of synergy. It is our mission to be in service of homeowners and business owners, contribute to each life we touch, and be of great purpose. EFFICIENT, PROFESSIONAL, RELIABLE ...Isn't that what you want in your next contractor? Then you've come to the right place! Copp Roofing & Construction, Inc. has been and continues to be the most efficient, professional, and reliable company for both residential and commercial properties in the Inland Empire and surrounding counties in Southern California. Hundreds of satisfied customers have trusted their homes and commercial buildings to the superior and skillful work of our certified and conscientious installers. We have been providing our fellow mountain residents and vacation homeowners with quality roofing since 1996. With the addition of our Siding and Decking divisions, we can now take care of the entire exterior of your home or building! The confidence that so many have placed in us is backed by the assurance that all three of our divisions are licensed and fully insured. You can rest assured that your job will be completed with the highest of standards and in a timely manner at a fair price. Our Experience + Our Commitment to Excellence = Quality Workmanship and Unbelievable Customer Care. Owner, George Copp alone has over 50 years of experience in the roofing industry. Combined with the expertise of our professional staff and installers, Our team has over 200 years of experience in the roofing and construction industry. We take great pride in a job well done! We install state of the art and energy efficient roofing materials, from dimensional and high definition composition and metal to authentic shake and authentic and synthetic slate. Take advantage of our knowledge and expertise, as well as, the relationships we have developed with the manufacturers of the most innovative and advanced products currently available. We are constantly searching for and researching the latest and greatest in new exterior building products in order to provide our smart and environmentally conscious customers with the very best our suppliers have to offer. 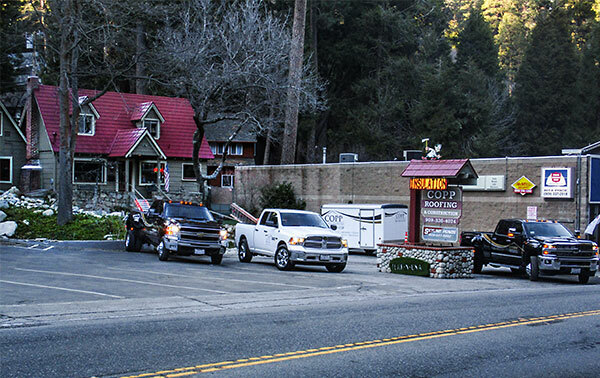 Copp Roofing & Construction's main office and mountain showroom is located in Blue Jay. To help customers in the selection process, we provide roofing material samples and pictures of satisfied customers' homes and businesses. 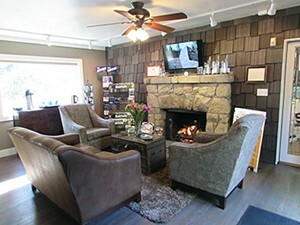 Come in and take advantage of our showroom experience at 26852 State Highway 189 in Blue Jay.